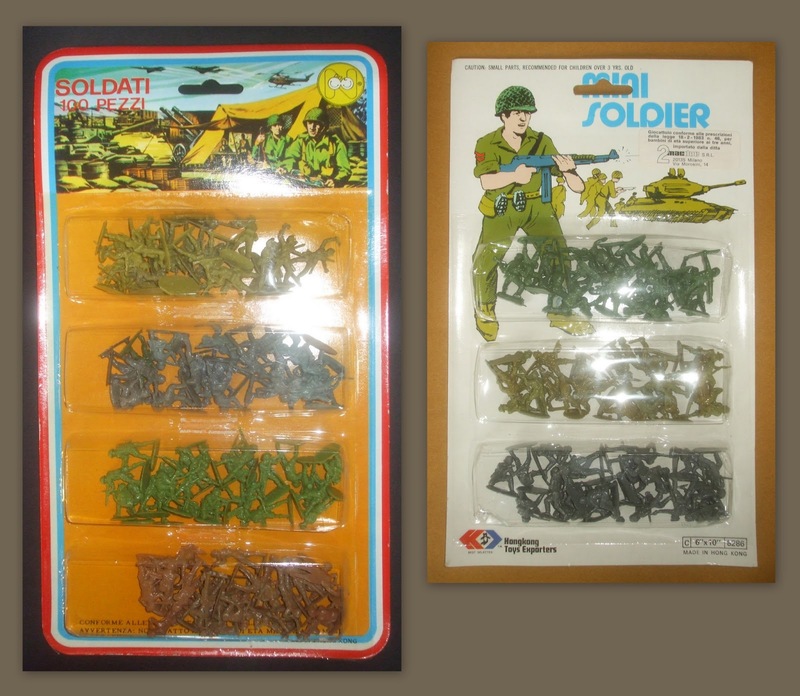 I had some army men when I was younger. No surprise. I have always thought of tracking them down as they were of exceptional quality and I only have a few left…somewhere…that avoided the horrors of battle. They were bought in about 1992-5 for about $2.00 USD in oz from a dollar store. They were about 25mm high (As I recall they were about that exactly) and mid-dark green. There were 80-90 in the packet and they came on long sprue strips with about 10 figures on each side. Soft plastic. The figures themselves were of very nice quality, unlike so many cheap green plastic army men I have seen. They depicted americans, germans, russians, japanese, maybe others. Each army had machine gun, rifles, bazooka, crawling, radio, commander, flamer, so on, astonishing variety and quality. They had ejection marks on the backs and I believe "HONG KONG" embossed on the bottom of the bases. Their bases were rectangular with rounded corners/ends and a lip around the words underneath. The packet they came in (Memory working overtime here) was a thick plastic bag with a folded card strip stapled on top. I remember blue on the card, maybe sky? It would have had a painting of army men, I assume, and a hole to hang it on. If any one can identify them, knows where some may be available, even just some reference somewhere, anything, it would be great. These look near exact, top right pic in particular. But they are said to be 54mm and the bases shown are of inconsistent shapes and there are extra poses I don't remember having. The poses and sculpt are otherwise exact, maybe from upscaled moulds. Sounds like Imex to me? Disasterwargamer, those look far too modern, in packaging at least. I think the figures may be 54mm and the bases/ colour look wrong. Ancientsgamer, very good. They may be from the range, or knock offs. The d day may be them, but they are grey. There may have been a more generic ww2 set in green? The photo is low quality, anyone know a clearer one? The third link is not working for me. They look to be copies of Matchbox figures, which were done I think in both 1/32nd and 1/72nd. I was just about to say they look identical to Matchbox figures. Years ago Dollar Stores had packs with chinese / hong kong knock-offs of Airfix or Matchbox figures, often with flags for each force. The copies weren't usually awful, and were possibly scaled-down 1/32 rather than 1/76, as they had Airfix paratroopers that were only done in 1/32. I think I will try and dig them out and take photos. 1/32 matchbox image search shows some promise. I think they may have been knock offs. Billy v toys bagged figures look close. I'm also eyeing of their civil war bags, any one used them before? I have exactly the ones from DisasterWargamer and they are the same that H Man linked to in the second post. They are, however, 54mm. I bought them in thought of running WWII skirmish games, as there is just about a properly organized platoon of each of four countries in the big round bucket. I imagine someone might have made a half-size knockoff at some point. In fact I think I once might have owned something like one of the four-packs in the above picture.